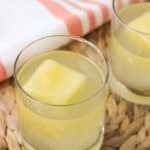 These fizzy pineapple ginger cocktails combine the bite of ginger with sweetness from pineapple juice (and pineapple rum!) for a refreshing drink recipe. Serve with fun pineapple ice cubes to prevent the cocktails from becoming watered down. Prepare ice cubes by pouring pineapple juice into ice cube molds at least a few hours before you anticipate enjoying these drinks. I used the excess pineapple juice from a can of pineapple chunks to make the ice cubes, pouring liquid through a strainer. A 20-oz can of pineapple chunks yields enough liquid to create plenty of ice for two drinks.